Endeavour Productions - 115 min. Cast: David Hemmings, John Hargreaves, Tony Barry, Martyn Sanderson, Grant Tilly, Diana Rowan, Ian Watkin, Terence Cooper, Bruno Lawrence. Producer: John Barnett; Director: John Laing. 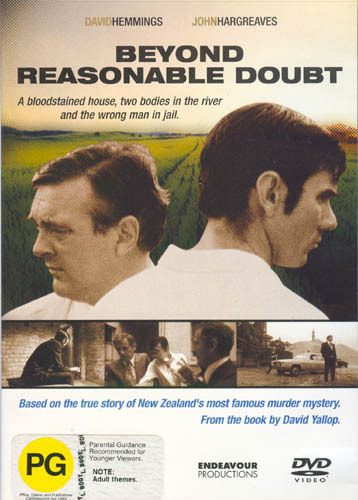 A docudrama of New Zealand's most famous murder case, based on the book of the same title by British author David Yallop. In June 1970 someone kills Pukekawa farmers Jeanette and Harvey Crew. Police inspector Bruce Hutton suspects neighbour Arthur Allen Thomas, and to secure a conviction, plants evidence. Thomas undergoes two trials and is convicted both times, but later, when proof of the plantings is revealed, is pardoned and paid $1 million compensation. Originally available in PAL and NTSC vhs. No known sources for new vhs. Used copies are occationally located from auctions for under $10us. An R4 PAL dvd is available from New Zealand sources for about $30nz. It is also available from Australian sources at about $25au. DVD extras include a 2:30min. trailer and a 42min. "Behind the Scenes documentary made by TVNZ. There are no subtitles. July 2014 - Police release review of Crewe investigation. TVNZ Kaleidoscope visits production sets about New Zealand's greatest and most controversial murder. 1982 - Winner of the Grand Prix at the Cognac Film Festival of Thrillers, France.